Some of us on the Enterprise product team spent yesterday at StartUp Camp, an unconference focused on helping the start-up community work through the challenges that arise with getting a business off the ground (something I wish I had had before starting my last company). The idea of the unconference, based on the Open Space methodology, is to have the attendees drive the agenda, with people interested in the same topics splitting off to different break-out rooms. Imagine the entire day as an extended coffee break at a traditional conference, which for me is usually when I learn the most from my fellow conference goers. All around the conference were reminders of the Open Space principles, including the "Law of 2 Feet," which states that, "If you're not learning or contributing it is your responsibility to respectfully use your two feet & find some place you are." Overall, it was a very refreshing conference format and I could see incorporating some unconference time into a more traditional conference format. Probably the highlight of the day was "speed geeking," where about 25 start-ups presented their elevator pitches and got feedback/grilled by conference attendees. There were a ton of interesting business models being pitched and I'm happy to report that state of the start-up culture is strong. Thanks to David Berlind, Doug Gold and Sun for organizing the event. 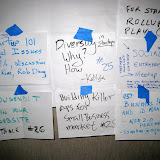 Below are some pics from the event, including some of the attendee-generated topics we discussed.